Shopping is made fun thanks to the colourful stripe pattern that adorns the Tasaraita shopping bag by Marimekko. Suitable for the market or the shop, the bag features the iconic print by Annika Rimala which is guaranteed to put you in a good mood. While the stripes of different colours have a subtle maritime charm, the cotton bag is as practical to do the shopping with, as it is to take to the beach. The bag is made of 100% cotton and can easily be cleaned in the washing machine. The pattern was designed in 1968 by Annika Rimala and graced the first unisex fashion series of all time, whichrepresented a revolution in the world of fashion at the time. Today the timeless pattern can be found on various household textiles and tableware by Marimekko. 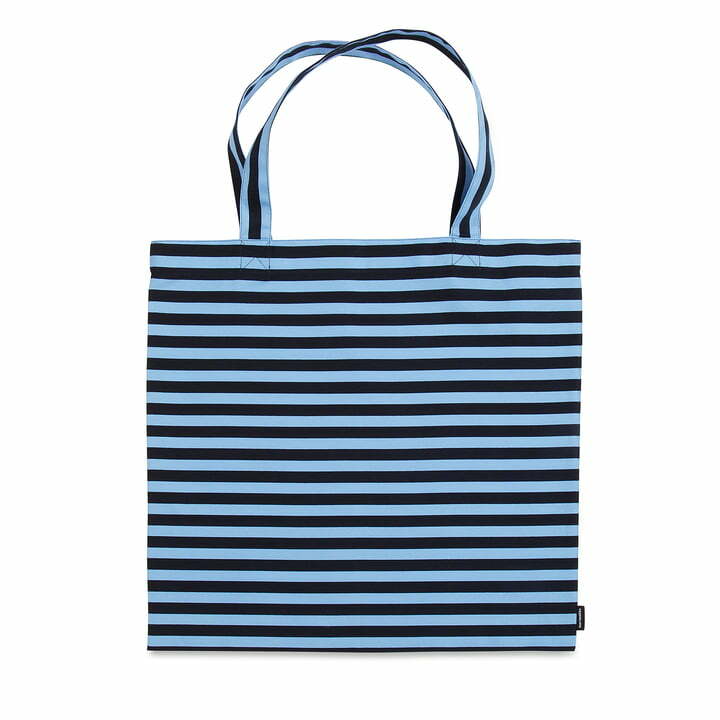 Isolated product image of the Tasaraita shopping bag by Marimekko in dark blue / light blue. The bag is made of 100% cotton and can easily be cleaned in the washing machine.